Remember when I said yesterday the best way to get tickets is to plan way ahead? Well, that's true, for sure. To a certain extend. "Never underestimate the power of luck" is my new motto today. And what a beautiful Sunday it has been. Full of passion, emotions and luck. This afternoon, I was watching, in total despair, the magnificent Covent Garden's La Fille du Régiment I also talked about yesterday. I was contemplating, with greater desolation, the fact that it will only come back in Paris in 4 years (2012). Who knows what can happen, in 4 years, to the voice of Dessay or JDF. I was therefore envying these lucky New Yorkers who will enjoy this production in April / May. I went to check the dates of the performances, in order to schedule the day of the broadcast. But then again, and I never say that, this production is going to lack so much with the sound only. And that's when the lightning struck. Not only were there still few seats available for the premiere on April 21, but I am indeed on vacation on this very week. 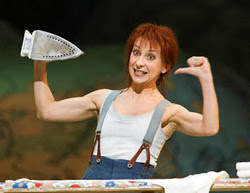 So, ladies and gentlemen, with overwhelming emotion, I will see this fantastic production of Donizetti's La Fille du Régiment live, in a few months. How great is that seriously? Associate Director/Dialogue: Agathe Mélinand (whose name is wrongly spelled on the MET's website - no luck for her there). Oh and by the way, I love the weak dollar against the euro too. €450 for plane tickets from Lyon to New York, that's what I call a bargain!